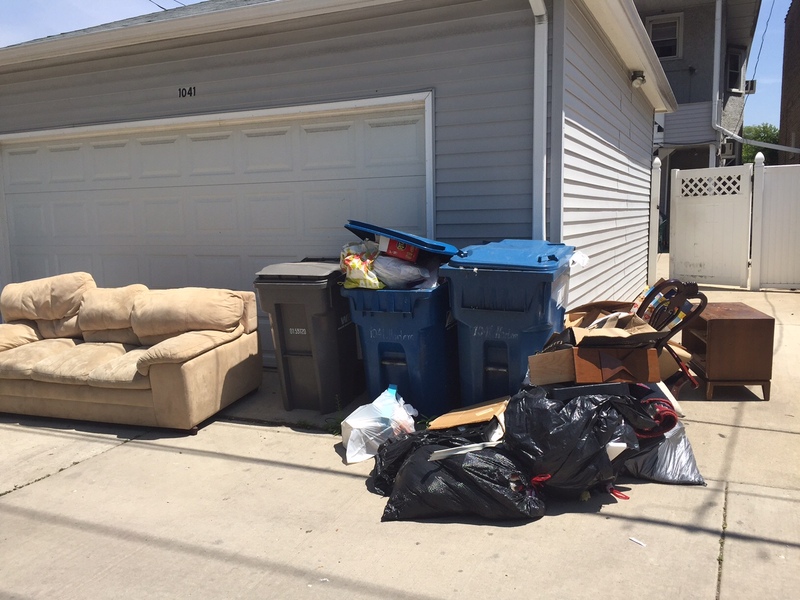 Flood-damaged furniture and other items left in the alley for the trash hauler. As strong storms with heavy rains pelted Chicago and the suburbs in late May, some residents of older homes were filled with dread: would their sewers back up into the basement as they had so many times before? Rob Neveau of the 3100 block of Wenonah Avenue in Berwyn said his first basement flood happened in 2014 shortly after he and his wife moved into their new home. Losses including the couple’s wedding pictures, furniture and “everything we had, basically,” he said. The heavy storm May 25 was déjà vu for Neveau, who found his basement filling with water again. By now, Nevaeu has installed shelving to lift valuables from the floor level and does not use the basement as a living space. “A lot easier to clean up, but one-third of the house is now unusable,” he said. For about five years, sewer backups have become more common in older towns with “combined” sewer systems that catch both rain and wastewater, according to a survey conducted last spring by the Illinois Department of Natural Resources. Municipal leaders surveyed said more flood-producing rainfall had fallen in the years between 2010 and 2014 than in the previous 10 years. Urban flooding is a regional problem in Cook County’s older suburbs, but each town has been forced to deal with it on their own. A new report by the Illinois DNR created last year tries to get a handle on flooding and what can be done at the state and city level. In Berwyn, the city created a flood mitigation rebate program for property owners that gave up to $2,500 to owners who wanted to install anti-flooding devices such as overhead sewers, check valves, of extra drainage. Other towns have tried other approaches. Elmwood Park partnered with a nearby country club to create $6.5 million temporary reservoir/swale that diverts rain water. River Forest announced a program to completely replace pipes for their combined sewer systems. Tinley Park has mandated overhead sewers in new construction since 1968. In Riverside, a state land agency bought out the properties next to the Des Plaines River that were constantly flooding. City-wide fixes take time and cost tax dollars. Many property owners can’t wait for a municipal solution. Last year, itchy hives broke out all over the skin of Frank Magallon, of Berwyn, which sent him to the doctor for allergy tests. From 2010-14, he said, his house had flooded eight times with raw sewage and water rain mix coming up from the floor drains. Magallon decided to remodel his basement down to the brick walls and cement floor. He was surprised when he saw what was behind the drywall. Instead, Magallon’s family bit the bullet, completely cleaned out the basement and installed an overhead system with the city grant. “The basement has been dry since then,” he said. Recognizing the problem is bigger than any individual municipality can handle alone, the IDNR hosted a series of meetings last spring and summer with local and state officials to focus regional resources on the problem of “urban flooding” — older residences, closer together, in combined sewer areas, which overflow when there is heavy rain. The Illinois Flood Risk Symposium met to figure out a regional plan and also identify steps municipalities can take — and how they can be paid for. Last summer IDNR released the final Report for the Urban flooding Awareness Act. The report estimated the damage of urban flooding between 2007-14, was $2.32 billion in documented damages. Private claims for basement flooding and sewer backup accounted for $1.24 billion, it said. The report said storm infrastructure repair in older communities is needed, but it’s not immediately feasible. The report suggested creating a “community rating system” that could identify risk of flooding in a consistent way. The report also recommended creating a public awareness plan to about sewer and basement insurance as riders through the National Flood Insurance Program. The state should help subsidize sewer improvements; help collect statewide data and help educate home buyers about the risks of flooding, the report said. The report also advised the state to make grant money available for local infrastructure repairs. The report recommends local municipalities plan ahead for local disasters; create flood-mitigating infrastructure if possible (such as permeable surfaces and retention swales.) The report recommends local towns help identify properties likely to flood and give owners information to help them avoid sewer backups. Other recommendations included monitoring heavy rains with real-time data collection and systematically fixing their outdated sewers. With the “new reality” of heavy flooding in Illinois and especially older suburbs, these recommendations may help municipalities create the best outcomes for their residents.